Tinea or athletes foot is a vey common problem seen by AMA Podiatrists. Tinea (tinea pedis) is caused by a group of fungi called Dermatophytes, a fungal infection of the skin. 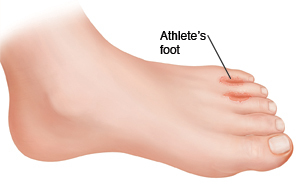 It most commonly occurs in between the toes, but it can be on the soles or slides of the feet. The fungus can be picked up from any damp or humid area where people walk barefooted, such as a bathroom, change room, gym, swimming pool or poor shoe hygiene. Following all the above should see the initial infection clear around a 7-day period. If symptoms persist consult your podiatrist who can review your treatment plan, and if needed recommend a referral to your local gp for follow up.